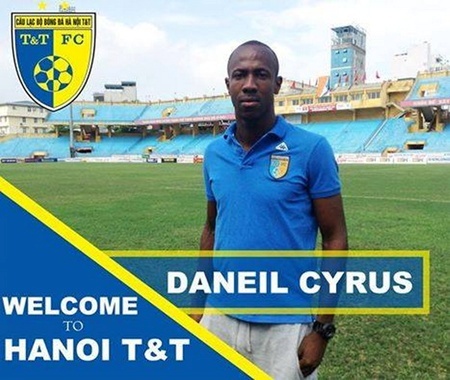 Ha Noi T&T have signed a one-and-a-half year contract with Cyrus Daneil, a footballer from Trinidad and Tobago (TT). He will play as a defender for the V-League side Ha Noi T&T, on loan from W Connection who have won the TT Pro League, Super League and the National Cup. “We are very glad to recruit this 23-year-old player,” said Nguyen Quoc Hoi, chairman of Ha Noi T&T. Daneil used to play for the Kansas City Club in the Major League Soccer in 2012 and had been summoned to TT’s U17 and U20 teams to take part in the U17 world event in 2007 and the U20 event in 2009. According to Hoi, Daneil’s salary is US$6,000 per month. At present, Ha Noi T&T have three foreign players, the other two being Hughtun Hector who is also from TT and Gonzalo Damian Marronkle from Argentina. “Domestic players play very well. With the combination of domestic and foreign players, we hope that our club will defend its title during this year’s football season,” said Hoi.